The Question:I was looking at a friend’s Windows 8 screen while at a meeting and saw that he had a ton of additional tiles on his startup screen that offered quick access to administrative tools of various types. As a Windows IT guy, I’d love to have that too. 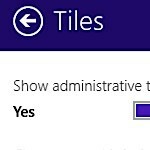 How do I enable these admin tool tiles on my own Win8 startup screen? As an administrator, you’ve already realized that for the most part Windows 8 is really just Windows 7 with a new layer that offers a more touch-friendly interface. Dig down far enough — and in some places it ain’t far at all — and you’re in familiar old dialog boxes and options. Most of the admin tools are that way, which is good since that makes it easier to administer. Getting to the admin tools, however, is a bit of a pain if you have to flip the cursor to a corner to get the Charms strip up and all. So let me show you how to enable (and, of course, disable) the administrative tools in Windows 8.